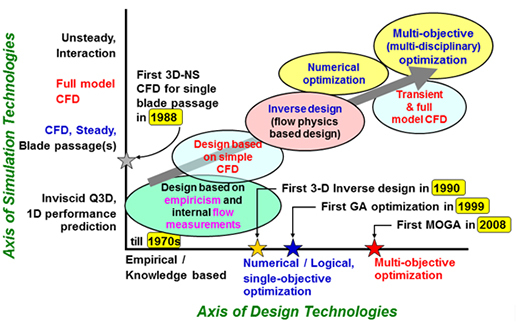 Fig.1 History of simulation and design technologies. Fig. 2 Multi-objective optimization of mixed-flow pump performance curves. Fig. 3 Trade-off selection for 4 design objectives using SOM (Self-Organizing Map). Fig. 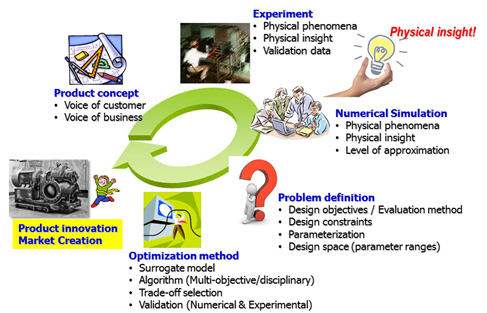 4 Multi-disciplinary optimization using empirical knowledge for design objectives. Fig. 5 Optimization of a double suction chamber for a centrifugal pump. Fig. 6 Image of workflow for product innovation. 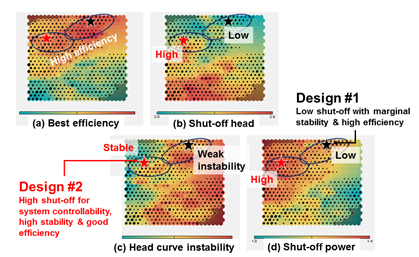 (1) Goto, A., “Study of Internal Flow in a Mixed Flow Pump Impeller at Various Tip Clearances Using 3-D Viscous Flow Calculations,” ASME Journal of Turbomachnery, Vol. 114 (1992), pp. 373-382. 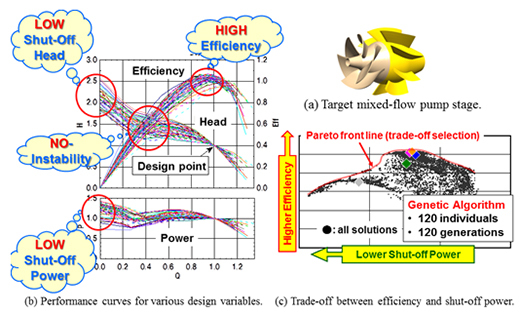 (2) Zangeneh, M., Goto, A., Harada, H., “On the Design Criteria for Suppression of Secondary Flows in Centrifugal and Mixed-Flow Impellers,” ASME Journal of Turbomachinery, Vol.120 (1998), pp723-735. (3) Ashihara, K. and Goto, A., “Turbomachinery Blade Design using 3D Inverse Design Method, CFD and Optimization Algorithm,” ASME Turbo Expo (2001). (4) Takayama Y. and Watanabe, H., “Multi-Objective Optimization of a Mixed-Flow Pump,” ASME Fluids Engineering Division Summer Meeting Vail (2009), FEDSM2009-78348. (5) Kohonen, T.. “Self-Organizing Maps,” Springer Series in Information Sciences, Vol. 30, Third, extended edition (2001). (6) TURBOdesign Shaper, Advanced Design Technology, Ltd.